Indulgent alpine escapes to winterize your skin and soothe your soul. Too chilly to hike, not enough snow to ski, October isn’t the month that naturally comes to mind for a mountain getaway. But what the “shoulder season” is perfect for is some serious spa time. Just like your car or your home, your skin also benefits from being “winterized” for the harsh weather to come – and what better place to do it than a gorgeous alpine setting? Here are our picks for where to go in the Rockies to treat your body and mind. Bodhi Tree Day Spa manicure and pedicure service. 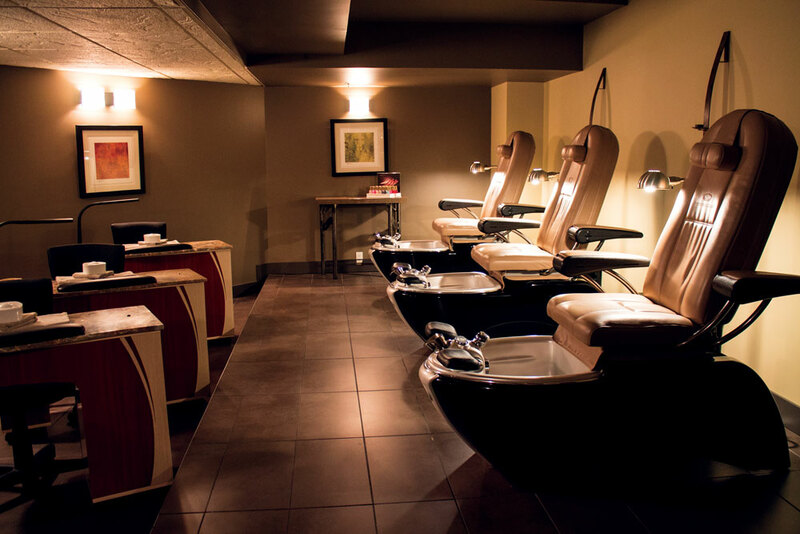 Located at the Silver Creek Lodge in the western part of town, Bodhi Tree Spa embodies the laid-back persona of a Canmore local. The two outdoor hot pools, included with each spa service, provide spectacular views of the Bow Valley peaks while you soak up the therapeutic rays of the sun. This facial treatment is a local favourite that goes beyond the face. The hypnotic flow of cleansing, toning, exfoliating and moisturizing is combined with a customized professional assessment on personal skin goals from head to toe. The service also invigorates body and mind with a deeply relaxing aromatherapy scalp massage. 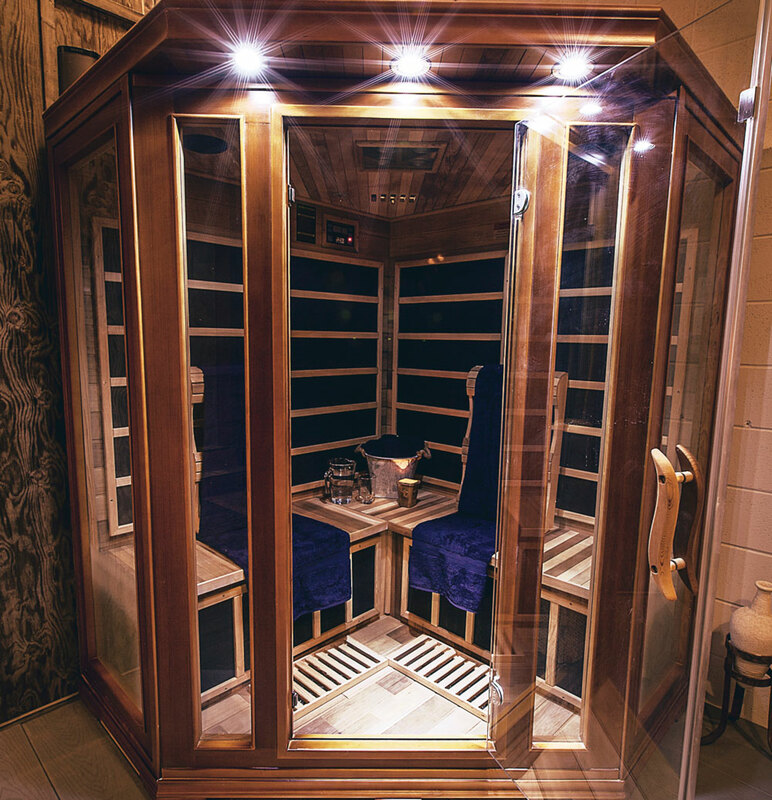 photograph courtesy of cedar & sage co.
Infrared Sauna at Cedar & Sage Co.
Open since 2014, Cedar & Sage, located on Bear Street, provides an escape from the bustling action on Banff Avenue. This self-described “holistic lounge” has infrared sauna treatments to warm you inside and out, and prepare you for the colder days to come. This service incorporates the holistic approach embodied within all of Cedar & Sage’s services – one of peace and restorative healing. The Grand Wetaskiwin package guides clients though a meditative journey with massage and infrared sauna, and then enhances the experience with a traditional First Nations-inspired smudging ceremony using California white sage for a spiritual cleanse. In addition to a clean slate for the coming winter season, the Grand Wetaskiwin is said to boost immunity and detoxify the body. Indoor view of Summit Spa at Delta Lodge, Kananaskis. It can be hard to remember to keep your muscles limber when you’re bundled up in bulky winter layers. The warm and cozy environs of the Delta Lodge at Kananaskis are the ideal setting to get your body in shape for all the snow sports in store. 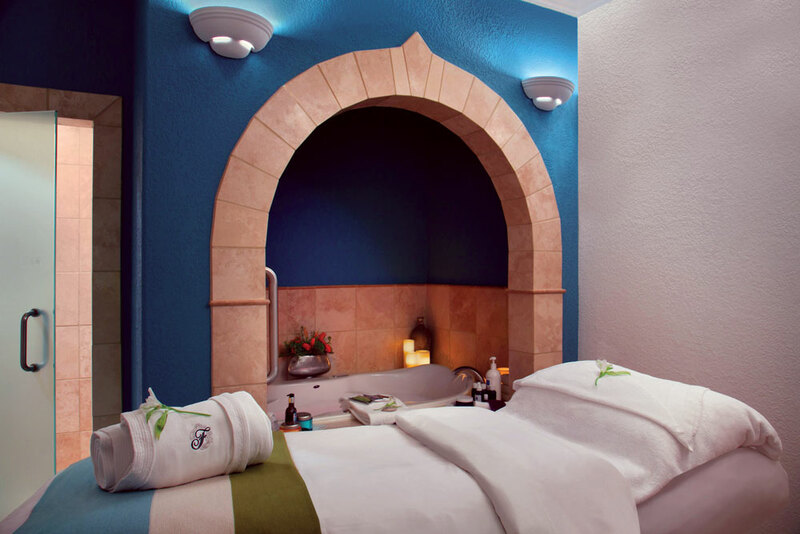 Hot-stone massages are designed to melt away tension and ease muscle stiffness. Summit Spa’s version also incorporates a natural Aveda aromatherapy oil of your choice. The warmth of the stones allows deeper access to muscle layers, targeting and releasing specific areas of tension. In addition to encouraging relaxation, decreasing stress and lowering blood pressure, this massage treatment helps boost circulation to help keep those toes warm all winter long. The Fairmont Chateau Lake Louise sits on the shores of one of the world’s most lovely bodies of water, so it’s only natural that one’s thoughts would turn to hydration. The Spa at Chateau Lake Louise offers a number of treatments that focus specifically on hydrating the skin and incorporate the soothing sensation of buoyancy. This exfoliating scrub is a full-body, deep-cleansing treatment designed to target dryness. 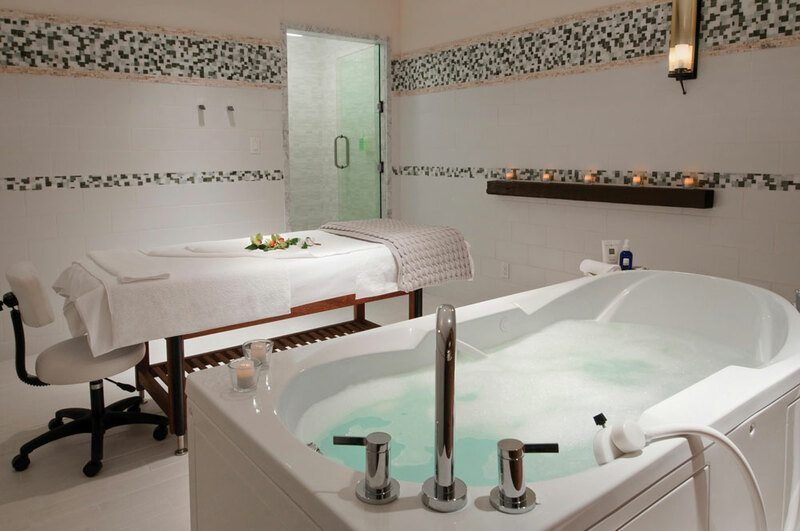 The treatment starts with an exfoliating loofah scrub followed by cleansing with an aromatherapy-infused gel in a private shower to prepare the skin for the application of a penetrative hydration treatment using aloe and chamomile. The final invigorating lotion rub is suitable for all skin types (even the most sensitive), and the treatment is topped off with a replenishing body spray to brighten skin and boost hydration. 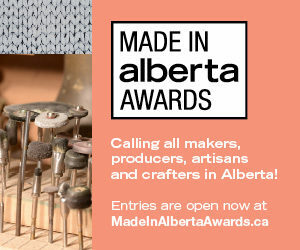 Layering is a skill that active Calgarians know a thing or two about – when it comes to winter sports it can make the difference between a good day and a bad day. The Spa at the Fairmont Jasper Park Lodge also knows a thing or two about layering, in the form of indulgent wrap treatments. 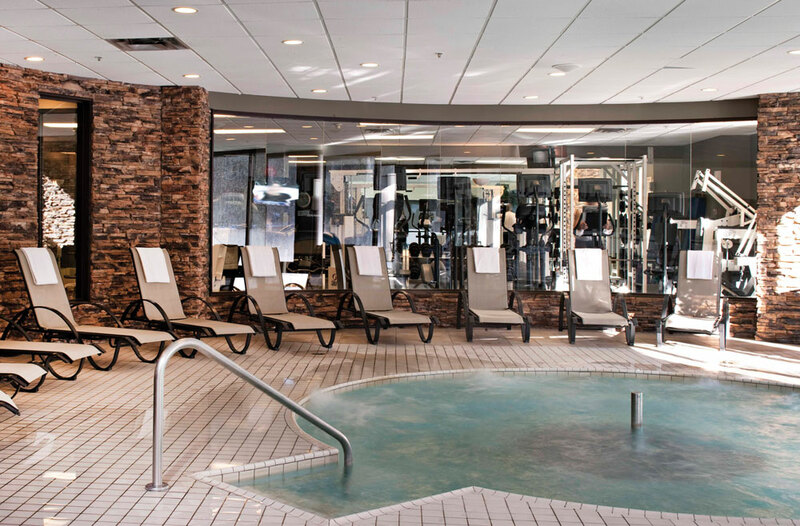 If you’re going to make the drive to Jasper, a day at the JPL’s spa is all the motivation you need to head out on the highway. This wrap treatment is designed to leave you feeling as refreshed as a bright blue sky. The service starts with a mineral-salt exfoliating treatment followed by a massage and a full-body layering wrap with mountain lavender, also known as “blue magic.” The experience is said to “tap the revitalizing power of blue mountain skies, glaciers and lakes,” sending you out into the alpine environs invigorated after a finishing scalp and foot massage. The elegant Fairmont Banff Springs hotel has much to boast about and its spa ranks high on that list. Willow Stream offers a variety of services geared at replenishing the nutrients within the skin. Each spa treatment includes access to three waterfall pools and the large indoor mineral pool. The native Alberta wild rose is the inspiration behind Willow Stream’s exclusive Rose Renewal treatment. The 90-minute, head-to-toe experience is pure indulgence, beginning with a gentle circulation dry-brush exfoliation, the bath of a lifetime (private, candle-lit and garnished with rose-petal and wildflower essences) and a rose-geranium and rose-flower oil wrap. The treatment culminates with a soothing rosehip oil massage.